What do you think, are you a great decision maker? How do you make decisions? Do you have to do a lot of research? Does not having “enough information” hold you back from making timely decisions? Do you make spontaneous decisions based on your gut feeling? Do you ask for input from your employees before you make decisions, which impact them? Do you have the reputation as someone who likes to “pass the buck” when a decision doesn’t turn out as it should have? We are all different and that’s a good thing but I believe it is important to acknowledge how we make our decisions and consider if we can make improvements in this area. When it comes to my decision making skills, I have to say that I’m pretty decisive. When I have to make a decision my natural instinct is to go ahead and like Nike says “just do it”. I am a very intuitive person and I often rely on my intuition and my gut feeling but there are also many situations that are based on facts and/or the input from others. Having said that, speed is only good when it is combined with clarity. Over the past couple of years I have learned to appreciate how beneficial it is when I take the time to get the opinion of others first. I truly believe that information overload is a decision killer. If you think you have to know everything before you make a decision, you will never make one or by the time you do, it is already too late. We live in a very fast paced business environment and we have to find a way that combines our sense of urgency with the ability to make clear and timely decisions. In the corporate world the lack of decisiveness is, unfortunately, very apparent. Have you ever received an email from someone who also cc’d just about everyone else just to cover their rear end? Almost every day, right? If this is the case in your company, you are most certainly dealing with trust issues throughout your organization. If people are afraid to make the wrong decision, they often try to avoid altogether making a decision. This is human nature and it may also be the reason why we see so many blame-storming sessions in our corporate environments. Decision making skills can be learned but if FEAR rules our emotions, it can really hurt the business and in many cases it already has. Fear causes inactivity and it usually takes our eyes of the target. If we become more concerned about ourselves than about anything else, it may be important to dig a little bit deeper. Usually, it is never as bad as it seems. In fact, it has been said that fear can be “false evidence appearing real”. Being fearful does not necessarily have to be a bad thing if we are aware of it. I think we should be fearful at least once a day because this is a sign of progress. If we never feel uncomfortable and nervous about a decision we have to make, it means that we have settled for mediocrity. If you would like to be a more decisive person, you have to first know the difference between the decisions that will make a difference and the ones that won’t. Don’t be afraid to get constructive feedback from the people around you because you will benefit from their insights by allowing them to speak with you directly. Decisiveness is not only a skill, it is also an attitude. 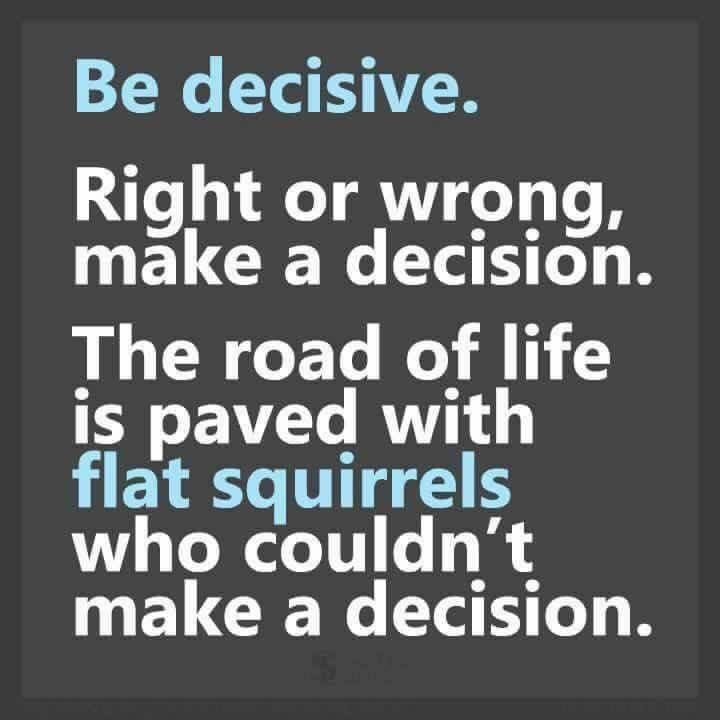 Make the decision to be decisive and you will be, otherwise you could possibly end up like one of those flat squirrels.